A Bat Mitzvah is one of the most significant events in a young girl’s life, and an important part of this coming of age celebration is the Bat Mitzvah party. Whether you are wanting a small, simple gathering or planning an extravagant affair, choosing the right theme is the first step in making the honoree’s day a memorable one and commemorating this special right of passage. 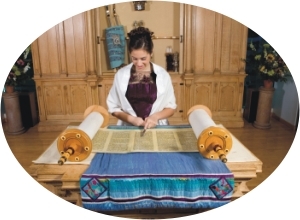 For Bat Mitzvah history, information, and more on Bat Mitzvah party themes visit the Jewish Wedding Rabbi. Have fun planning this momentous occasion and please come back and share all the details about your fabulous party here. Make the guest of honor feel like a celebrity on her special day by having a tv/movie themed Bat Mitzvah. 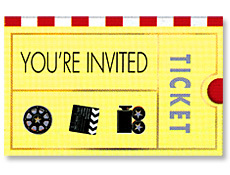 Create an invitation shaped like a movie camera, premiere ticket, or clapboard and tuck it inside the formal Bat Mitzvah invitation, or send it at a later date. You may even wish to request that guests come dressed as their favorite celebrity or wear formal attire. Roll out a red carpet, and arrange to have some “paparazzi” in the cocktail area snapping pictures and interviewing guests as they arrive. A large clapboard or movie poster featuring the honoree could be used in place of a guest book. Decorate with pictures or cardboard cutouts of celebrities and use plenty of silver and gold balloons. To add a touch of sophistication, throw some glitter on the tabletops and use top hats filled with flowers as centerpieces. Be sure to have picture stations complete with costumes including boas, hats, and jewelry, allowing guests to dress up and snap a memento of their evening. Send your guests on their way with a copy of a favorite DVD or CD, a photo frame, or even a personalized top hat. 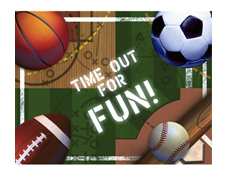 One of the most popular choices for a Bat Mitzvah party is a sports theme. Themed invitations can be designed to look like event tickets bearing the name of the guest of honor as the main attraction and can easily be inserted into the formal bar mitzvah invitations. Depending on the sport chosen, decorate with plenty of appropriately shaped balloons: volleyballs, basketballs, tennis balls, soccer balls, etc. Have a picture of the guest of honor made into a large trading card and place it in the cocktail area for guests to sign. Alternatively, guests could “autograph” banners, balls, bats, hats, or pennants as mementos. Wait staff could even be dressed in stadium uniforms and offer popcorn or other snacks to guests as the arrive. Set food booths up as concession stands and use a sports theme seating card. To entertain guests throughout the evening, have portable basketball, soccer, or pitching nets set up so everyone can have an opportunity to show off their skills. If your Bat Mitzvah falls near this important Jewish holiday, or if you just wish a more traditional theme, why not have a Chanukah party? Put a Chanukah Invitation in with the formal one to inform guests of the theme. You could even include some Chanukah confetti inside the envelopes. Have Hanukkah music playing as guests arrive and provide a guest book, a hanukkah banner, or large picture of the guest of honor to be signed. 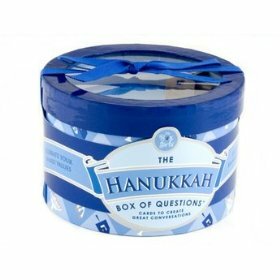 To decorate, wrap various sized boxes in Chanukah paper with blue bows and place around the room. The “presents” can even be hung from the ceiling or used as centerpieces. Scatter Chanukah confetti on tabletops and have several bouquets of blue, silver, and white balloons. Place a dreidel or a dreidel filled with candy at each place setting (blue and white jelly beans or smarties is a good suggestion)and be sure to include a large Menorah somewhere in the room. Additional lighting could be provided by Chanukah candles, small lanterns, orblue glow sticks and rings. Thank your guests for sharing your special day by giving favors of blue and white boas or wrapped chocolate gelt (chocolate coins). Every girl loves the beach, and even if her Bat Mitzvah is in the middle of winter, you can add a little warmth to her special day with a Beach/Luau themed party. Create invitations using a flower lei, sunglasses, or miniature plastic palm trees and ask that guests come dressed in something tropical. Give everyone a lei on the way in and offer them tropical drinks complete with little umbrellas or fruit skewers. For something different, provide a large beach umbrella or straw hat in place of a guest book or a banner. 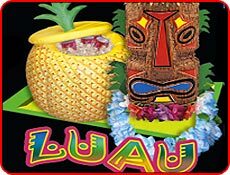 To decorate, wrap tables in grass skirts, set up tiki huts, inflatable palm trees, and use fruit bowls or tropical plants as centerpieces. If you are artistic, you could create a sunset or ocean mural and bring in small plastic pools filled with sand and toys for younger children to play in. Lighting could be provided by lanterns or tiki torches. Have several beach balls or fabric Frisbees around the room to keep guests entertained and be sure to have a photo area that provides grass skirts, sunglasses, or even a faceless cutout so everyone can pose for a portrait. Of course, remember to play plenty of Hawaiian music and set aside an area where guests can try their skill at the limbo. Favors could include flip flops, leis, or straw hats. Make your guest of honor feel like royalty by planning a Princess Theme party for her Bat Mitzvah. Create invitations shaped like castles or tiaras and place them inside the formal Bat Mitzvah invitation, or send separately at a later date. If you wanted, you could even ask guests to come dressed as a character from a popular fairy tale. Place a large picture of the honoree on an easel for guests to sign as they arrive and have wait staff offer everyone hors d’oeuvres and punch. Create a footbridge for guests to cross as they leave the cocktail area and enter the main party room. To decorate, string lots of white mini lights across the ceiling, table edges and doorways. Use pink, white, and silver balloons and place silver candelabras around the room. Large vases or bowls of white, red and pink roses make nice centerpieces. 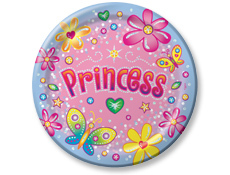 Of course, no princess party is complete without a ball, so be sure to mix plenty of traditional dances and music in with the more modern selections. Female guests could be given tiaras or long stemmed roses as favors, and gentlemen could be given personalized chocolate bars. An American Idol/Karaoke Theme is fast becoming one of the most popular choices for a Bat Mitzvah party. Have the guest of honor create a DVD - comical or serious depending on how well they sing - outlining the party details, and include a copy in with the formal invitations. As guests arrive, they can be given an entry number to wear and then asked to sign a life sized cardboard cut out of the guest of honor dressed as a superstar. Have the music of past American Idol winners playing. 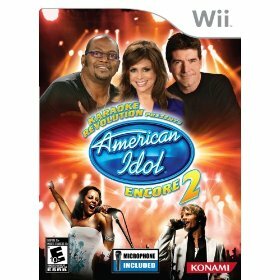 American Idol Karaoke for Nintendo Wii, Playstation 2 and 3, and X-Box 360. To decorate, use dark colors accented with plenty of glitter or silver complements. Navy tablecloths scattered with silver confetti and tableware will create the “night club” effect and give authenticity to your party. If you have access to a disco ball, you may wish to hang it over the dance floor, and string several silver stars from the ceiling. Be sure to have a large stage and set up a judges table for the performance part of the evening. You may wish to have several songs available so guests can choose to perform Karaoke style, or you could inform guests ahead of time to come prepared with their own music if they would like to perform. Set up a video area and have several props available for those who want to make their own music video. Awards can be given for the new “Idol” winner, or the events can be just for fun. A cd by the guest of honor’s favorite performer, a music trophy, or a personalized glow-in-the-dark star can be given as favors. 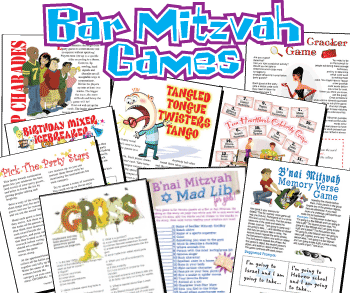 Tell Us About Your Bat Mitzvah Party! Tell us what you did, what you ate, how the place was decorated, and what the invitations were like. Tell us anything about the party that made it memorable to you! Your Party Theme and description will appear on a Web page exactly the way you enter it here. You can wrap a word in square brackets to make it appear bold. For example [my party] would show as my party on the Web page containing your party details. Do you have a picture or yourself or your party? Great! Click the button and find it on your computer. Then select it.